West Ham succumbed to a third consecutive defeat in all competitions with a 3-0 defeat at the hands of newly-promoted Wolves. Manuel Pellegrini opted to rest several first team players for the weekend's FA Cup tie at Wimbledon - but having conceded seven goals since making that decision, must be questioning whether it was the right move. Having been thrashed by League One's bottom club on Saturday nothing less than a brave and fully-committed performance would have sufficed at Molineux this evening. However West Ham were put to the sword by a Wolves side who easily brushed aside United's challenge. 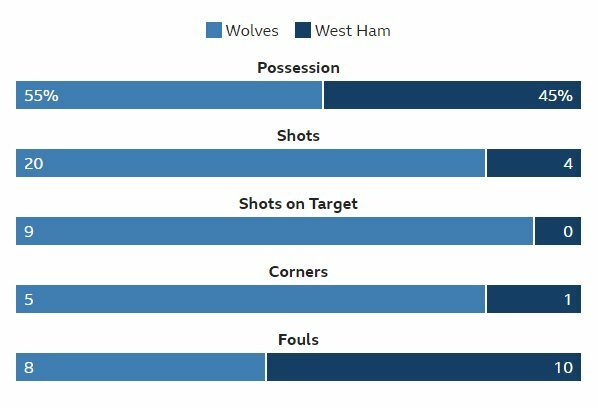 Although the hosts dominated the opening half, creating 11 shots to West Ham's two (neither of which were on target), the two sides entered the half time interval still on level terms. The second half continued in a similar vein and the only surprise was that it took Wolves 21 minutes to open the scoring. The goal, which came from a set-piece, arrived via the head of Romain Saiss. Nuno Espirito Santo's team doubled their lead in the 80th minute - and surprise surprise, the goal came from yet another set-piece with Raul Jimenez profiting from West Ham's dreadful defending. And the Mexican international made it 3-0 to Wolves six minutes later, converting from close range after West Ham's defence was once again caught at sixes and sevens. West Ham Utd: Fabianski, Zabaleta, Diop, Ogbonna, Masuaku, Snodgrass (Obiang 69), Rice, Noble (Carroll 68), Anderson, Antonio, Arnautovic. Wolverhampton Wanderers: Patricio, Bennett, Coady, Saiss, Doherty, Dendoncker, Neves, Moutinho (Gibbs-White 89), Jonny (Vinagre 90), Diogo Jota (Traore 89), Jimenez.